In a comment to an essay by Professor Michael Dorf assessing Judge Andrew Hanen’s opinion and order blocking some of the Obama administration’s recent executive actions on immigration, Professor Steven Shiffrin poses the question of whether the injunction should be understood not as questioning the “prosecutorial discretion aspect” of the Obama administration’s initiatives, but rather as being “concerned with that part of the policy affording affirmative benefits” — an argument that, as he notes, is presented by Professor Michael McConnell in the Wall Street Journal. Instead of merely refusing to enforce the INA’s removal laws against an individual, the DHS has enacted a wide-reaching program that awards legal presence, to individuals Congress has deemed deportable or removable, as well as the ability to obtain Social Security numbers, work authorization permits, and the ability to travel. Absent DAPA, these individuals would not receive these benefits. The DHS has not instructed its officers to merely refrain from arresting, ordering the removal of, or prosecuting unlawfully-present aliens. Indeed, by the very terms of DAPA, that is what the DHS has been doing for these recipients for the last five years — whether that was because the DHS could not track down the millions of individuals they now deem eligible for deferred action, or because they were prioritizing removals according to limited resources, applying humanitarian considerations, or just not removing these individuals for “administrative convenience.” . . . Had the States complained only of the DHS’ mere failure to (or decision not to) prosecute and/or remove such individuals in these preceding years, any conclusion drawn in that situation would have been based on the inaction of the agency in its refusal to enforce. . . . Exercising prosecutorial discretion and/or refusing to enforce a statute does not also entail bestowing benefits. Non-enforcement is just that — not enforcing the law. Nonenforcement does not entail refusing to remove these individuals as required by the law and then providing three years of immunity from that law, legal presence status, plus any benefits that may accompany legal presence under current regulations…. These claims by both McConnell and Judge Hanen that the Obama administration is trying to “grant lawful status” to millions of undocumented immigrations are at the core of their objections to both programs. The claims are entirely continuous and of a piece with the kinds of accusations that anti-immigration politicians and opinion writers now casually throw around about DACA and DAPA on a routine basis — that the initiatives amount to “executive amnesty,” that they turn “anchor babies” into “automatic human shields” for their “illegal parents” (Rep. Steve King), that they amount to an outright “refusal to enforce our current immigration laws” (Rep. Bob Goodlatte), that they give “illegals … legal status,” (Ben Carson), and even that “in effect” they involve “printing up [and] counterfeiting immigration documents” (Sen. Ted Cruz). And on and on and on. As political rhetoric, the charges leveled by McConnell, Judge Hanen, and these anti-immigration politicians and opinion writers make for useful talking points and arresting sound bites. As legal claims, however, they’re also completely false. To be sure, in practice, once individuals are notified they have been granted deferred action — whether under DACA, DAPA, or otherwise — they could be understood to subsequently receive a highly limited form of quasi-legal recognition. As Geoffrey Heeren elaborates in an excellent forthcoming law review article, deferred action is only one of many longstanding forms which that quasi-legal recognition for noncitizens can take, forms that he collectively refers to as “nonstatus.” Indeed, as both Linda Bosniak and Gerald Neuman have explained in different ways, in important law review articles published many years ago, that kind of quasi-legal recognition necessarily and invariably extends in varying forms and degrees to all undocumented immigrants — without regard to deferred action or any other form of “nonstatus” — insofar as both constitutional and statutory law have never fully excluded undocumented immigrants from the ambit of legal protection and recognition in the United States altogether. As a result — notwithstanding what Judge Hanen insisted in his opinion, with evident alarm — there is nothing “irreversible” about deferred action or the DACA and DAPA programs. 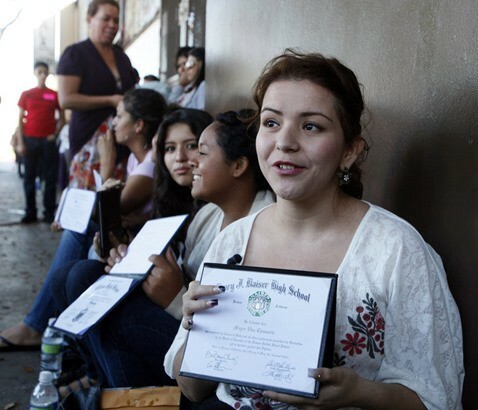 To the contrary, deferred action is reversible by its very nature. The programs might very well be difficult to reverse politically once instituted — but it is difficult to see why that should be legally relevant to any court in deciding whether or not to grant an injunction unless it wishes to operate as a transparently political actor. And yet, the clear implication in the rhetorical sleights of hand fashioned by both McConnell and Judge Hanen is that these initiatives somehow create a rigid, durable form of “lawful status” under the immigration laws that flouts the will of Congress — a form of “executive amnesty,” if you will, that turns “anchor babies” into “automatic human shields” for their “illegal parents” and gives “illegals . . . legal status.” As the actual nature of deferred action makes clear, that suggestion is misleading in the extreme. However, that passage refers exclusively to the interpretation of the definition of “unlawful presence” in a specific provision of the INA, governing bars on future admissibility for individuals who have previously been “unlawfully present.” The statement has no bearing on lawful immigration status. Because of the complicated way in which Congress has drafted the immigration statute — making it a “hideous creature,” as Professors Stephen Legomsky and Cristina Rodríguez put it in the very first sentence of their immigration law casebook — the definition of “lawful presence” under that provision has a number of exceptions and qualifications, and is not coextensive with the meaning of “lawful status” under the immigration laws. Indeed, that is precisely the point of the passage on the DHS website that Judge Hanen quotes: terms like “lawful status” and “lawful presence,” as used in various federal and state law contexts, do not have a uniform and shared legal meaning and are not always coextensive with the core meaning of “lawful status” for immigration law purposes. In a number of different ways, DHS emphasizes the same point around half a dozen times on the very same page of its website: deferred action does not provide lawful status under the immigration laws or a path to citizenship. Judge Hanen, however, does not bother even to acknowledge that fact — much less to engage its legal significance — and instead chooses to try to hide the ball. McConnell’s own assertion would have an element of truth if DAPA purported to give its recipients green cards and lawful permanent resident status — and might even have a more limited grain of truth if it purported to give its recipients temporary nonimmigrant visas. However, deferred action of course does no such thing — and, as such, the program “dispenses with” precisely none of what McConnell claims that it does. Noncitizens who are eligible for DAPA remain subject to the ten-year prospective inadmissibility bar, and their U.S. citizen and lawful permanent resident children remain unable to petition on their behalf for lawful permanent resident status before reaching the age of 21. More broadly, the Obama administration can hardly be accused of suspending or dispensing with the enforcement of the immigration laws. To the contrary, the administration has not only enforced those laws to the maximum extent of its appropriated funds, but in so doing has removed more individuals than any other administration in U.S. history, at a clip that now exceeds 400,000 individuals per year. Immigrants’ rights advocates have pointedly called President Obama the “deporter in chief” for enforcing the immigration laws so aggressively; current and former Obama administration officials, by contrast, have defended the vigorousness of their approach to enforcement. No matter which side has the better of that argument, the fact and nature of the emergent regime of mass deportation at the heart of that dispute gives any suggestion that the Obama administration has suspended or dispensed with “entire sections of this country’s immigration laws” — to put it charitably — an exceedingly odd, “through the looking glass” quality. 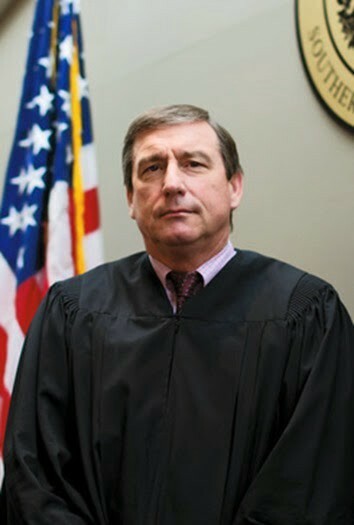 Judge Hanen is not wrong in observing that individuals who have been granted deferred action (whether under DACA, DAPA, or otherwise) can become eligible to seek some affirmative benefits — albeit benefits that are considerably more limited than those available to individuals who are in fact lawfully present in the United States. But as noted above, the availability or non-availability of any such benefits is governed by separate legal authority and administrative guidance that long predate DACA and DAPA. 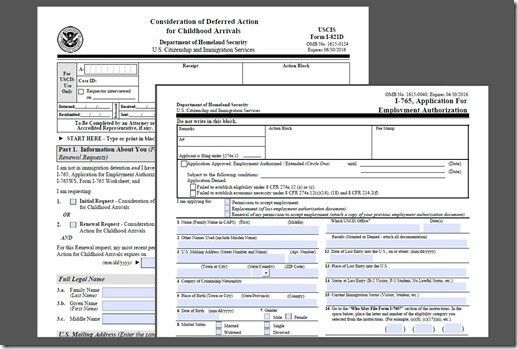 Like the question of “unlawful presence” for purposes of the prospective inadmissibility bar, questions concerning eligibility for those benefits are therefore conceptually separate from the questions concerning an individual’s immigration status and the exercise of prosecutorial discretion. If Judge Hanen’s ruling were really confined to the question of benefits, then one also would expect the opinion to devote some attention — indeed, any attention — to analyzing the federal, state, or local legal authority that governs whatever benefits troubled him. However, having devoted an enormous amount of ink making a complete hash out of analyzing the “lawful status” that DAPA and DACA supposedly confer, Judge Hanen’s opinion then proceeds to devote essentially no attention at all to the question of whether the executive branch has legal authority, whether inherent or delegated, to extend benefits to individuals who are granted deferred action under DACA, DAPA, or otherwise. Take, for example, employment authorization. Eligibility for employment authorization for deferred action recipients is not governed by the DACA or DAPA programs, but by regulations that predate those programs by decades. Indeed, under DACA and DAPA, applications for deferred action and for work authorization are not even submitted using the same forms — strictly speaking, they are separate application processes governed by completely different criteria. Since at least the 1960s, the executive branch has exercised delegated authority to grant and deny employment authorization to various categories of noncitizens — including recipients of deferred action, but only to those who could affirmatively show an economic necessity to work. Formal, codified regulations have governed those practices and procedures since 1981. When Congress adopted the Immigration Reform and Control Act of 1986, it legislated against the background of those practices and regulations and recognized this executive authority more expressly by statute, defining noncitizens’ eligibility for employment in the United States to include individuals “authorized to be so employed by this Act or by the Attorney General” (emphasis added). Soon after IRCA was enacted, the INS denied a formal petition (which was filed before IRCA was enacted) to rescind these employment authorization regulations as beyond its legal authority. In denying that petition, INS noted Congress’s express recognition and preservation of its regulatory authority in IRCA while the petition was pending. 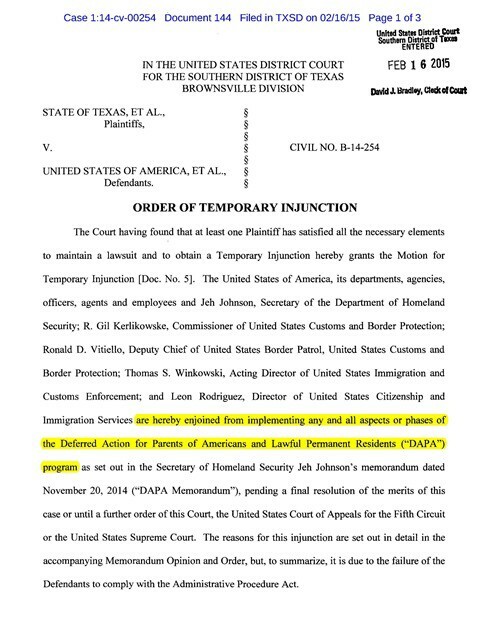 An injunction along those lines might have blocked the issuance of employment authorization documents or whatever other “benefits” Judge Hanen were concerned with, but it would have let DHS proceed with its plans under the DAPA and expanded DACA programs to accept and grant applications for deferred action itself — which, after all, has been a principal means by which immigration officials have implemented their exercise of prosecutorial discretion for decades, as discussed above. If Judge Hanen really meant to preserve the authority of federal officials to exercise prosecutorial discretion, then there would be no basis to enjoin the process by which those officials grant deferred action under the Obama administration’s initiatives, since that is what deferred action is — nothing more and nothing less. Perhaps the sweeping nature of the injunction should not be surprising in light of the sweeping nature of the substance of Judge Hanen’s opinion. While much public discussion of the ruling has emphasized its formally narrow disposition — the basis of the decision in the Administrative Procedure Act’s notice-and-comment provisions, and the opinion’s express reservation of both constitutional questions and any conclusion about the legality of DAPA and expanded DACA on the merits — Judge Hanen does not leave a whole lot of doubt about where he stands on those issues. As Professor Eric Posner notes in Slate, the opinion is “pregnant with constitutional rhetoric that suggests he sympathizes with the critics’ arguments.” And, as discussed above, pregnant with plenty of non-legal rhetoric that makes those sympathies all but crystal clear. At its core, therefore, Judge Hanen’s ruling seems best understood as fundamentally calling into question deferred action as a legitimate means of exercising prosecutorial discretion altogether — and in addition, as questioning the substantive criteria and means established by the Obama administration under DACA and DAPA to exercise that prosecutorial discretion. Which also, necessarily, entails a challenge to the ability of executive branch officials to establish and meaningfully implement enforcement priorities and exercise discretion to carry out those priorities. In the immigration context, the executive branch’s prioritization of certain categories of potentially removable noncitizens is not simply authorized by Congress under its broad delegations of immigration authority — including both express delegations and what Professors Adam Cox and Cristina Rodríguez term “de facto delegations” — but also derives from a direct congressional mandate. For example, appropriations legislation in recent years has directed executive officials to prioritize deportation of individuals with convictions for “violent crimes,” and of course the resources appropriated by Congress are themselves not sufficient to seek and effectuate removal of more than a fraction of the individuals who are potentially removable under the immigration laws — particularly given the extent to which Congress has dramatically expanded the categories of individuals who are potentially subject to removal. (And unlike in many other contexts, without any statute of limitations.) To give effect to the administration’s enforcement priorities in this context, DACA and DAPA establish categorical eligibility criteria for the exercise of prosecutorial discretion — along with, as is frequently neglected, categorical disqualifying criteria that render ineligible many individuals who might otherwise qualify — and then confer discretion upon lower level officials to make case-by-case determinations about whether to grant deferred action. What this somewhat confused statement appears to add up to is a conclusion that deferred action itself might be somehow illegitimate — whether granted under categorical programs such DACA or DAPA or under the largely unguided and unsupervised practices that have been in place for decades. Genuine prosecutorial discretion, Judge Hanen seems to be saying, must not only involve purely case-by-case decision-making, but also ad hoc and unguided decision-making that takes place without any supervision or direction from senior officials. Both of those conclusions are problematic when applied to DAPA and DACA. For one thing, as Professors Eric Posner and Cass Sunstein have both emphasized, DACA and DAPA actually do, in fact, involve case-by-case decision-making: discretion remains for lower-level officials to deny requests for deferred action even when individuals satisfy the eligibility criteria. The extent to which supervised, categorical approaches to prosecutorial discretion might be justified in the interest of uniformity, consistency, and predictability has been much less prominent in debates over DACA and DAPA than arguments about resource constraints and humanitarian considerations, although it has been noted at least in passing as a rationale by a handful of scholars, including Professors Hiroshi Motomura, Gillian Metzger, and Sai Prakash. However, the limited attention given to this rationale should not cause us to minimize its significance. Especially as the scale of immigration enforcement has grown to such massive levels — making the task of ensuring uniformity and consistency in the execution of the law and the implementation of enforcement priorities an even more formidable challenge — the need for appropriate and effective supervision of lower level discretion has only grown more important. On Judge Hanen’s view, however, senior executive branch officials apparently would be required to, well, “abdicate” any responsibility to supervise lower level discretionary decision-making and let the vagaries of the bureaucracy reign supreme. For critics of these initiatives, characterizing Judge Hanen’s ruling as a narrow one might be understood as helpful in their attempts to legitimate the decision as a reasonable one — to make the decision seem less radical, sweeping, or “off the wall,” as Professor Jack Balkin would put it, than it actually is. (Which is not to suggest that Professor McConnell himself is motivated by such instrumental ends in presenting his argument, but simply to observe that the characterization itself may be relevant to how Judge Hanen’s decision is perceived and understood.) 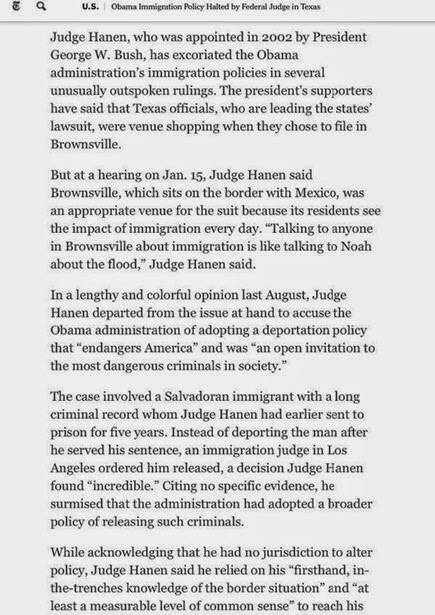 When it comes to immigration, Judge Hanen has amply demonstrated — well before President Obama announced his most recent executive actions — that he has very strongly held personal views on the subject. While those opinions made Judge Hanen an especially appealing judge for Republican governors when they were shopping for a judicial district in which to file their lawsuit, they may be a bit less convenient now, as defenders of Judge Hanen’s decision try to assimilate that ruling into the legal mainstream. Attempting to characterize Judge Hanen’s decision as modest or narrow in some fashion might seem useful in trying to temper his earlier, inflammatory comments and to rehabilitate his public image. At the same time, if we’re simply concerned in non-instrumental terms with characterizing Judge Hanen’s ruling in an accurate manner, then both sets of responses seem off the mark. Interestingly, politicians critical of the Obama administration’s immigration actions have been eager to defend Judge Hanen’s ruling in considerably more maximalist terms than McConnell — for example, characterizing the decision as having definitively concluded that the initiatives are “illegal” and “unconstitutional” because they create a form of “executive amnesty.” These political comments may be no less instrumental insofar as they reinforce the points these Obama administration detractors have long been trying to score; to some extent, those politicians also may simply be offering those characterizations in aid of their ongoing legislative fight to tie funding for DHS to proposals that seek to eliminate the Obama administration’s programs. At another level, however, these politicians make a perfectly reasonable observation, for to conclude that Judge Hanen’s ruling is in any sense “narrowly crafted” appears to seriously miss the forest for the trees.